This recipe is so good! I found it over at www.locarbyum.com . It is going to be a go to recipe for company breakfast! It can be made the night before. Just let the pie dish get to room temp before baking. Pre-heat oven to 375 degrees F. Grease a 9 inch pie dish. Set aside about ¼ cup of beaten egg. In a large bowl, combine the rest of eggs with 2 cups of mozzarella cheese and garlic. Stir in spinach. Pour into pie dish. Layer the asparagus on top of egg mixture. Pour reserved egg on top of asparagus. Sprinkle the ½ cup of grated cheese and the parmesan cheese on top. Bake for about 30 or until the edges are brown. 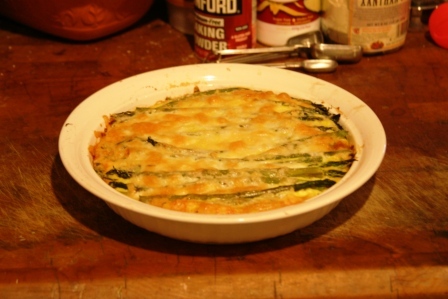 This entry was posted in breakfast, Low Carb, main dish and tagged asparagus, breakfast, breakfast for dinner, cheese, eggs, Low Carb. Bookmark the permalink.